The Barbary pirates of North Africa were a scourge to maritime trade for many centuries. 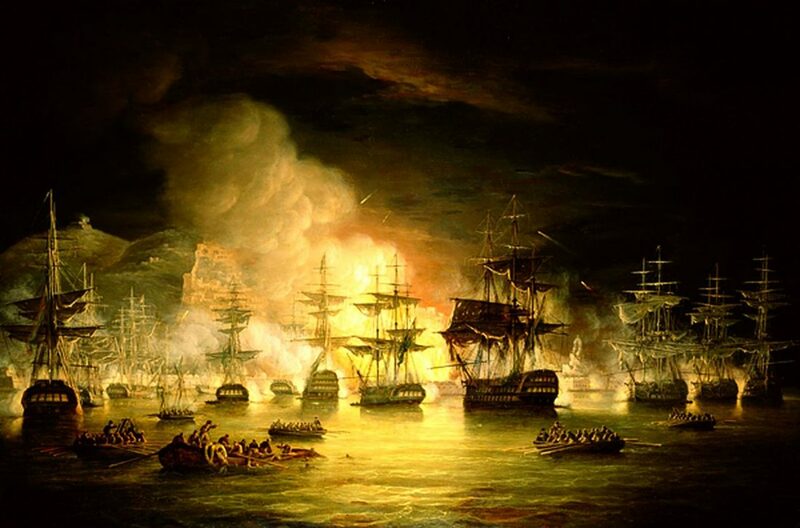 It was only in the nineteenth century that major naval and military campaigns – most notably the US Navy’s and Marine Corps’ intervention on “the Shores of Tripoli”, the Anglo-Dutch action against Algiers in 1816 and the French conquest of Algeria in the 1830s – largely put an end to the menace. The qualification “largely” is however important as piracy did continue, albeit on a more spasmodic basis and limited scale then previously. Morocco was still independent through most of the nineteenth century and pirates still operated off its Northern Atlantic and Mediterranean coasts – known as the Riff area – in much the same way that Somali pirates have done in our own time. The proximity to important shipping routes passing through the confines of the Straits of Gibraltar or down the African coast ensured potentially rich pickings. Two examples, from as late as 1848 and 1851, and involving the Royal Navy, illustrate the risks to small merchant ships operating in the area. These will be detailed later in this article. In both these cases, action was undertaken by paddle sloops, a new type of ship, of which 49 were built for the Royal Navy between 1830 and 1851. Though made up of individual classes, these vessels were generally similar as regards tonnage and length – typically less than 1000-tons and of approximately 180-feet long. They carried both sail and steam, the latter power in the form of a reciprocating engine of around 400-horsepower and driving paddlewheels. Though not intended for ship-to-ship combat, since their paddlewheels provided large and vulnerable targets, they carried a powerful armament for their size, typically four 32-pounder or 8-inch smoothbores. With this gun power, and with a crew of 130, of whom a major proportion could be sent ashore as “bluejackets” to constitute small naval brigades, they were ideally suited for action against shore targets or poorly armed adversaries. 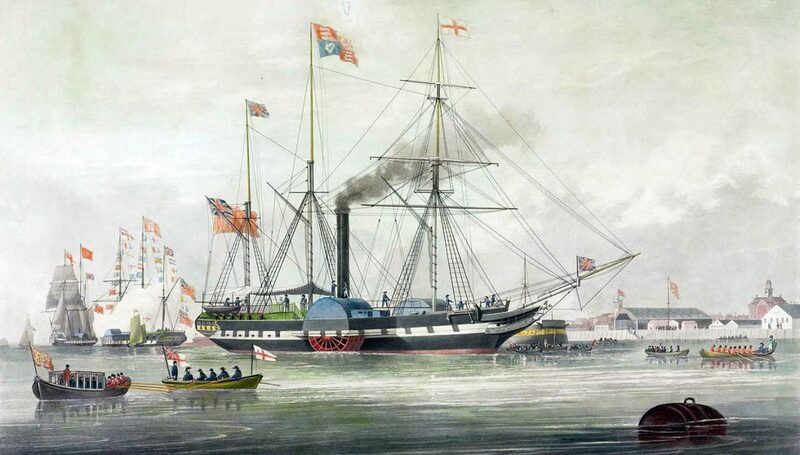 They saw and amazing range of action – one was to be the first steamer to circumnavigate the globe while others saw action in the Black Sea, North Pacific, Baltic against the Russians in the Crimean War and against the Chinese in the Arrow War and others still did valuable survey duty. This surveying, which produced the maritime charts which in updated form are still in use today, was one of the greatest – and often forgotten and underestimated – achievements of the nineteenth-century Royal Navy. 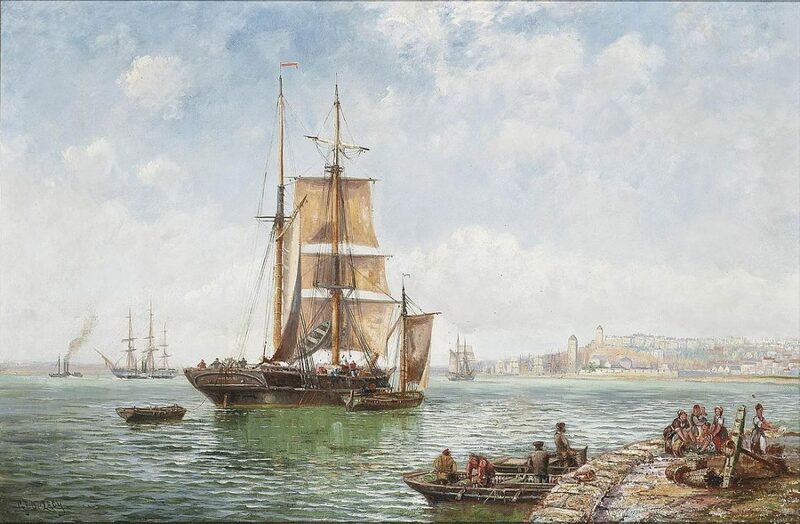 “A trading brig drifting into a Continental harbour” by Charles John De Lacy (1856-1929) – the unfortunate Three Sisters would have looked generally similar. Three years later, in 1851, a more serious act of piracy resulted in several deaths and the enslavement of the remainder of the crews, when the brigantine Violet and the schooner Amelia were captured off the Riff coast. When news of this was received at Gibraltar, another paddle slop, HMS Janus, commanded by a Captain Powell, was sent to retaliate. Both of the hijacked vessels were found wrecked on shore but the Janus destroyed a number of pirate craft in the vicinity with gunfire. Others were drawn up on the shore and boats were sent in to destroy them. Large numbers of pirates and tribesmen had gathered however and they launched an attack so furious that the landing party had to retreat to the Janus, with Captain Powell himself and of his crew being wounded. The only bright spot was the liberation of the Violet’s crew. It would be interesting – and probably horrifying – to know what became of their counterparts from the Amelia. These cases were typical of dozens of small and often bloody actions undertaken by the Royal Navy in this period. Forgotten today, they demanded initiative, courage and supreme professionalism, creating in the process a cadre of officers and seamen second to none. And the paddle sloops? Their day was done by 1860, by which time the screw propeller, with the advantage of being hidden below the waterline and thus less vulnerable to gunfire reigned supreme. In their time they had rendered valuable service and deserve to be remembered with respect.